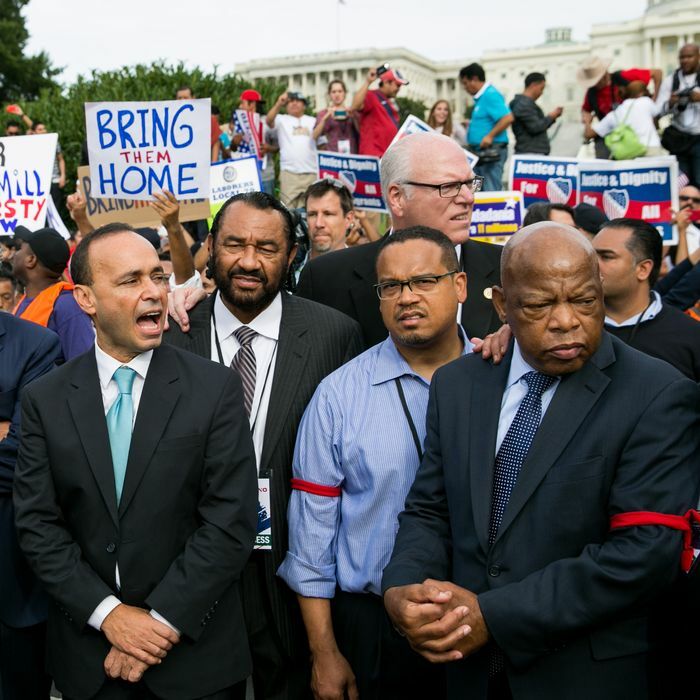 Don’t expect to see Luis Gutierrez, Keith Ellison, or John Lewis on Friday. The number of Democratic lawmakers refusing to attend Donald Trump’s inauguration keeps climbing, with 53 House Democrats now planning to boycott Friday’s ceremony, according to the Washington Post. It’s uncommon for lawmakers to boycott the inauguration for political purposes, but a day earlier about two dozen Democrats said they would not attend. Many said the final straw was Trump’s feud with Representative John Lewis over the holiday weekend. Lewis said he does not consider Trump a “legitimate president” because he believes the Russians helped get him elected, prompting the president-elect to attack the civil-rights icon on Twitter. Trump might have done little to stem the protest, refusing to drop the issue and attacking Representative Lewis again on Twitter Tuesday. This time, the president-elect challenged the civil-rights leader on his statement that Trump’s inauguration would be the first he missed since joining Congress in 1987. “It’s a shame that these folks don’t want to be part of the peaceful transfer of power,” Spider added, “but it’s within their right.” He maintained that enthusiasm for the inauguration remained high, and there would be plenty of crowds, regardless of the protest. The celebration some Democrats are now missing out on appears to be far more low-key than expected. While Trump himself said there was once talk of a parade up Fifth Avenue or a helicopter ride from New York to D.C., Boris Epshteyn, communications director for the Presidential Inaugural Committee, tells the Post that the event will be “workmanlike.” While some inaugural parades have taken more than four hours, Trump is expected to spend just 90 minutes walking down Pennsylvania Avenue. The only announced performers are the Mormon Tabernacle Choir, the Radio City Rockettes, and singer Jackie Evancho. But Trump’s inauguration may not be as Spartan as Epshteyn suggests. The inaugural committee has raised more than $90 million for the celebrations, while Obama brought in $53 million in 2009. Seven-figure donors will reportedly receive tickets to a “candlelight dinner” featuring “special appearances” by the new First Family. The committee has also ordered customized thermal blankets that will be distributed to those on the dais (though it’s expected to be in the 50s on Friday). Otherwise, it’s unclear where the money is going. “With a pared-down inaugural, I don’t know what they could possibly use $90 million on,” Steve Kerrigan, a top organizer for both of Obama’s inaugurations, told the Post. Trump may find some way to burn off the extra money over the weekend. Sure he wants to “get to work,” but who does business on Saturday and Sunday?